Trying to be as productive as possible during my infrequent down time, I just published another Kindle book with some of my best tips for Oracle Data Modeler. 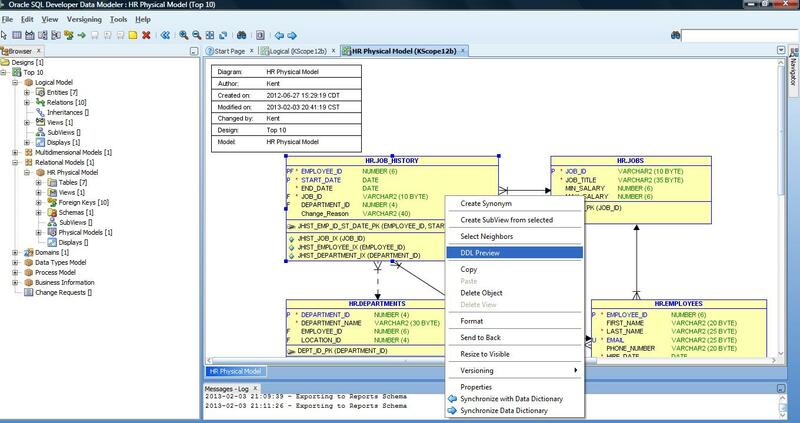 it is called Better Data Modeling: Tips for Enhancing Your Use of Oracle SQL Developer Data Modeler. If you are one of the 3.5 million users (or so) who have downloaded this tool, and you want to know my little secrets for getting the most out of SQL Developer Data Modeler (#SQLDevModeler), this book if for you. If you were an Oracle Designer user and are looking for a replacement data modeling tool, or you are using one of the other mainstream, expensive modeling tools and want a more cost effective alternative, then you owe it to yourself to look at Oracle SQL Developer Data Modeler (SDDM). Oracle Data Modeler has been around for over five years now and is up to version 4.1. It really is an industrial strength data modeling tool that can be used for any data modeling task you need to tackle. SQL Developer Data Modeler (SDDM) is a fully functional tool provided for FREE by Oracle. It has many features built in that can be leveraged to capture the design of an existing (probably undocumented) database or you can use it to design a new database, even a data warehouse from scratch. There are a load of great features. This book will show you my favorite features along with detailed step by step instructions (with screen shots) on how to use them. As a bonus, there are two appendices with my run down on common data modeling mistakes and my famous rant on why you need foreign keys in your data warehouse. 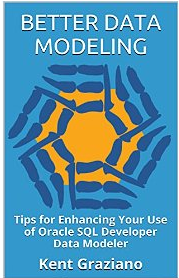 So if you don’t use Oracle Data Modeler yet, read my book to see why you should. If you do use it, I hope this little book will make you even more productive than you already are! P.S. After you read the book, please leave a review on Amazon to help other folks decide if the book is for them. This question came up at the recent World Wide Data Vault Consortium. Seems there are still many folks who build a data warehouse (or data mart) that do not include FKs in the database. The usual reason is that it “slows down” load performance. No surprise there. Been hearing that for years. 1. So what! I need my data to be correct and to come out fast too! 2. Show me! How slow is it really? Keep in mind that while getting the data in quickly is important, so is getting the data out. Who would you rather have complain – the ETL programmer or the business user trying to run a report? Yes, it has to be a balance, but you should not immediately dismiss including FKs in your warehouse without considering the options and benefits of those options. Drop the constraints at the start of the load then add them back in after the load completes. If any fail to build, that tells you immediately where you may have some data quality problems or your model is wrong (or something else changed). Build all the constraints as DISABLE NOVALIDATE. This puts them in the database for the BI tools and data modeling tools to see and capture but, since they are not enforced, they put minimal overhead on the load process. And, so I am told by those that know, even a disabled constraint helps the optimizer make a smarter choice on the join path. (really 2a) Best of both – disable the constraints, load your data, then re-enable the constraints. You get optimization and quality checks. So NOW what is your reason for not using FKs in your data warehouse? One of the best practices I recommend is to always define unique business keys for every entity (or table) in a model. It is the only way to really understand what the data in that object represents. So what do you do when you inherit someone else’s model with hundreds of tables and few (if any) unique keys to be found? After you reverse engineer it into SDDM (SQL Developer Data Modeler), you could go through the model table by table and look at the properties. Or, you could look at all the diagrams to look for the the little U’s indicating a column is part of a unique key constraint (assuming there are any diagrams to look at). Or you could create a Custom Design Rule that checks for you. So how do you write a design rule that will list all tables with no UKs on them? Open your design, the go to Tools -> Design Rules -> Custom Rules. Hit the green Plus sign to add a new rule. The result will be a list of all the tables in your design that do not have any Unique Key Constraints defined. Now the real work begins – fixing those tables! As you work your way through the model adding the new business keys, you can keep using this report to see which ones you have left, and make sure you don’t miss any. Get to it my friends! P.S. Special thanks to DimitarSlavov of Oracle for posting the code to answer my question. If you want to see the whole thread go here.